I have plenty of e-books on my Kindle (some in the cloud and some in local only) and I created many Collections to classify my books. One silly things I tried first time was to create a folder hierarchy in my computer and when I transfer the root folder in the Kindle, it was flatten; In fact I learn after the Collections are not equivalent to Folders (it would be too simple...). After transferring few hundreds of books (and took some free ones from Amazon site) I did not found any other way to choose a Collection and then browsing all e-book from the kindle. My question is: is there a way to prepare the Collections structure from the computer (Windows and Mac OS X) and to have the books already classified after transfer? There is Kindle Collection Manager (I didn't try that.) Here are some instructions. And here you can find the developer. Calibre also has a Kindle Collection manager plugin, here is a howto, a semi-official forum. It's available on Win and Mac, no need to jailbreak your Kindle devices. So, a big f*** you Amazon and thank you for locking this possibility while you provide such a cumbersome GUI interface. Kindlian is a cool add-on for Kindle device and works on Windows XP/Vista 7/8. It supports Kindle Keyboard&Kindle Black&Kindle Grey, Kindle Touch, Kindle Paperwhite. The main function of this program allows us to import and manage Kindle Books and collections. First Download and install Kindlian for win. Plug your kindle into a computer and run this program. Step1: Choose your kindle version. (the follow step will take kindle paperwhite as example.) Once you tap kindle paperwhite and press the icon, the pop up screen prompts you to disconnect kindle. Tap "Settings" from kindle menu-->"Upadate your kindle". Then reconnect kindle with your computer. At last press "OK". Then it will enter the scan mode and then the new interface appears. Once you finish adding books to your destination collection, and click "disconnect" icon. Then it will prompt you to disconnect your kindle with computer. When you disconnect your kindle with computer, tap "Settings"-->"Update Your Kindle". At last, tap "Settings"-->"Restart". 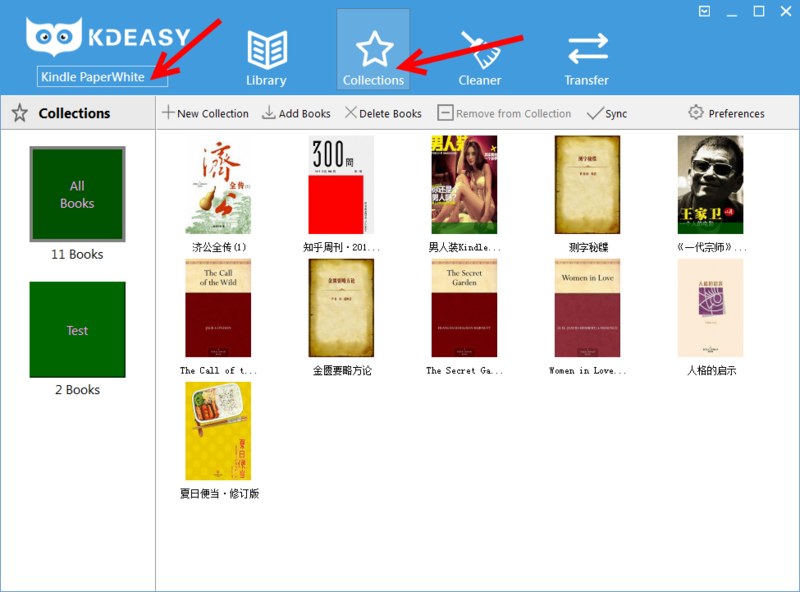 Just for a while, the "kindle collection test'' which I just create appears in my kindle paperwhite now. Wonderful, I succeed in managing my kindle books. Not the answer you're looking for? Browse other questions tagged kindle software cataloguing collections or ask your own question. I can't find the mobi format ebooks I copied from my computer to my kindle via usb, what should I do? For Kindle DX Graphite, how to quickly add books to different “Collections”? Possible to transfer Adobe Digital Edition ePUB books from my local library to my Kindle? cloud-based epub reading system with offline reading AND collections — what are my options?